Your small business has different needs at different stages. Think Beyond the Desktop offers a selection of service tiers designed to meet your bookkeeping needs at every point. Whether you’re just getting started or have grown to include multiple employees or locations, we’ve got a service plan that’s the right fit for you. *Fees shown are base prices for each listed tier. A custom quote will be provided for your business based on core complexity and transactional volume. Solopreneur – Owner managed businesses have specific needs and this plan will meet them. We will take care of your formal bookkeeping, including posting all income and expense transaction, reconciling accounts and preparing basic financial reports. The accurate and timely reporting we provide allows you to make more informed decisions about your business too. Let us manage your bookkeeping so you can focus on growing your business. 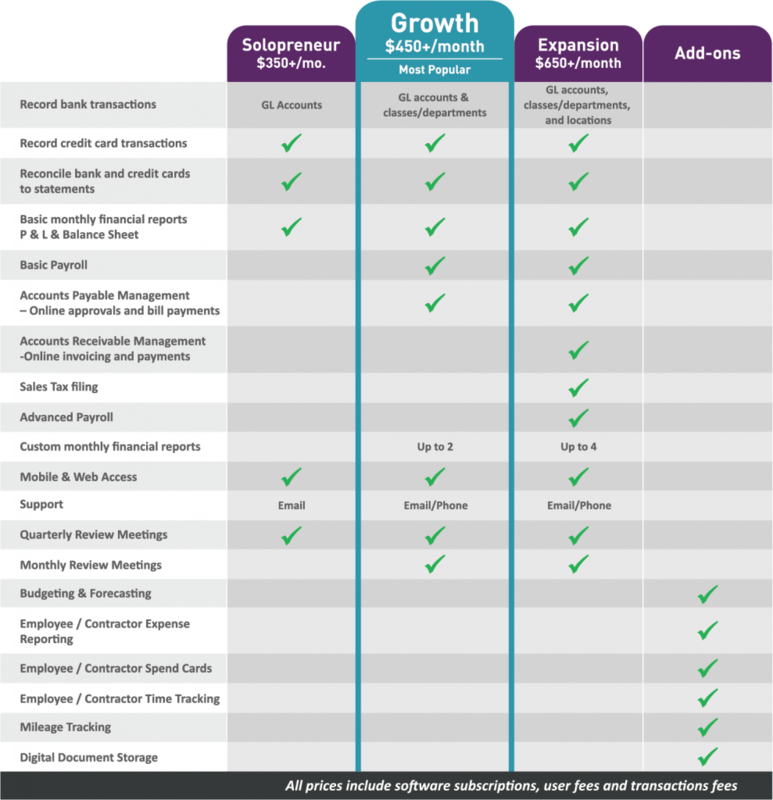 Growth – Once your company has grown a bit, you’ll need the benefits of our Growth service tier. With this plan, we provide all the services above, but also help manage your accounts payable, manage your payroll and meet monthly to review financial reports to help you plan for growth. This added level of detail and oversight is essential for a maturing business and will ensure it is on the right track to becoming the enterprise you have always envisioned. Expansion – By now, your company has become an established enterprise with several employees. With a higher volume of business, multiple departments or additional locations, you need even deeper detail in your accounting and bookkeeping. The Expansion tier gives you custom reporting to help you keep clear, organized financial records for your business and its activities. Add-ons – Have specialized needs that don’t fit neatly into the descriptions above? Businesses that mostly fit into one of our options but require services that fall outside of the listed tiers may choose to utilize additional services for an added fee, without moving up to the next tier. Our dedicated and experience, U.S.-based team will manage all your bookkeeping and accounting, as well as providing reports, consultation and financial insights that help you keep your business on sound financial footing. Judie McCarthy, our owner and president, will oversee operations, review reporting and regularly meet with you to discuss your financial picture and new challenges or needs that may arise. What if I need to change plans? We can discuss whether it’s time to change monthly plans any time you are interested. During your quarterly or monthly review, we’ll also examine this issue, along with other important questions to make sure you’re getting everything you need to help your business grow. Fees are collected monthly via automatic ACH (bill.com) from your bank account. You can choose whether you’d like the fee to be drafted on the 1st or 15th of each month. If you decide to handle your bookkeeping another way, you may cancel at any time, by providing us with 30 days’ notice. It’s not difficult to cancel if you want to – but we’re confident you won’t want to! Most definitely. We know that every business is different and can adjust any of our service to include additional features. Contact us directly for a quote on your custom-designed service package. Absolutely! We pride ourselves on only using cloud-based applications that meet strict security standards. Each application has a minimum of 256-bit SSL encryption (the same security used by banks). All data is backed up redundantly to protect against system failure, unlike desktop data that can be stolen or lost due to theft, computer failure, fire or other natural disaster.